Our product range includes a wide range of microprocessor visible spectrophotometer, double beam uv-vis spectrophotometer, uv cuvettes, uv-vis spectrophotometer, variable double beam uv-vis spectrophotometer device and single beam uv-vis spectrophotometer. Riding on unfathomable volumes of industrial expertise, we are offering an excellent range of Microprocessor Visible Spectrophotometer. 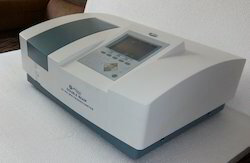 This spectrophotometer is widely used in various industries. Our diligent professionals only use fine quality components, while manufacturing this spectrophotometer. 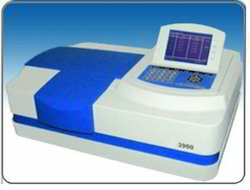 The provided spectrophotometer is excellent on count of functioning owing to its precise size and perfect finish. Moreover, our offered spectrophotometer can be availed by our valued customers at industry leading prices. Being a client-centric organization, we are engaged in offering a distinct collection of Double Beam UV-VIS Spectrophotometer. Under the guidance of adroit professionals, this spectrophotometer is manufactured using quality tested components with the aid of sophisticated methodology. Our offered spectrophotometer is rigorously tested by our quality controllers on several measures of quality to eliminate any kind of defect. Moreover, the offered spectrophotometer is extensively acclaimed for featuring variegated attributes such as easy usage and durability. The True Double Beam UV-VIS spectrophotometer with advance circuit measurement and control system , make the instrument with high reliability and low noise. Excellent software design and procedure, make instruments have stronger spectral data processing function; Automatically scam measures spectra, multi wavelength (1 -3 Lambda) determination, kinetic determination, 1-3 curve fitting, 1-4 derivate spectra, access, display print spectra and analyze data. Powerful window based software platform user-friendly, powerful, easy to store or output. UV-VIS Spectrophotometer / Pharmacy Lab Equipment’s Model: AT-UV-2800, Spectrophotometer/ Pharmacy Lab equipment offered comes with fast, medium and slow scanning speed options and can provide functioning support with photometric range of -0.3 - 3.5 A, 0 to 220 %T, wavelength accuracy of +0.3 nm, wavelength reproducibility of < 0.10 nm and photometric accuracy of + 0.3% T (0-100% T) & +0.002 A (0-0.1 A). Some of its other standard features include wavelength range of 190-1100 nm Czerny Turner, the spectral bandwidth of 1 nm, double beam (1200 lines/mm Grating) based optical system as well as other support offered in form of software CD, RS 232 Cable, operation manual and dual silicon photodiode-based detector support. AC:220V + 10%, 50 Hz. 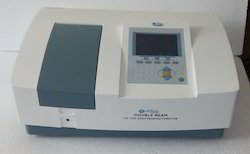 Variable Double Beam UV-VIS Spectrophotometer Device offered comes with a wavelength range of 190-1100 nm (1200 Lines/mm grating) as well as Basic/Quantitative/Wavelength Scan/DNA Protein Test/Kinetics operational modes. For efficient performance, the system can deliver Fast / Medium / Slow scanning support as well as wavelength accuracy of +0.1 nm, bandwidth of 0.5, 1,2,4,5 and wavelength reproducibility of 0.1 nm. Some of the other standard features of this system include photometric repeatability of + 0.2 % T, baseline flatness of + 0.001 A, USB based data output port and parallel printer port among others. 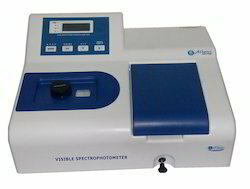 Single Beam UV-Vis Spectrophotometer, Range 195 to 1000 nm with facility for automatic concentration, % Transmission, Absorbance & K Factor measurement. Automatic wavelength calibration and selection. It has sample holder with 4 position selector control for 10 mm path length cuvettes. Facility has been provided for interface with any printer (USB PORT). 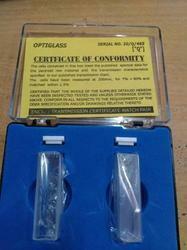 Set of 2 quartz and 4 glass cuvettes is provided. Highly stable and accurate. Software Included (Imported) stoca kein Test/Kinetic, automatic peak picking & spectrum display. Large screen with graphic display. Spectrum and data can be printed out by printer and sent to computer via USB PORT. Set of 4 quartz and 4 glass cuvettes is provided. 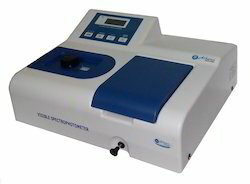 UV Spectrophotometer. Athena UV Spectrophotometer offered comprises single beam microprocessor UV/VIS spectrophotometer that is made available in range from 195 to 1000 nm as well as with facility for % Transmission, Absorbance & K Factor measurement and automatic concentration. Also coming with 4 position selector control for 10 mm path length cuvettes and sample holder support, it can easily be interfaced with any printer (RST 232C). Further, we offer the system with support of imported software as well as set of 2 quartz and 4 glass cuvettes that allows the system to perform smoothly. Double Beam UV Visible Spectrophotometer, offered comes with wavelength range of 190-1100 nm, spectral bandwidth of 1 nm, working mode of T,A,C,E and double beam based optical system. 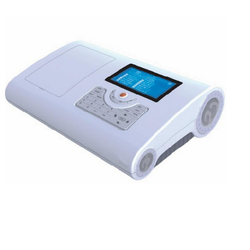 Further, the system can deliver fast, medium and slow scanning speeds and have other support options including glass cells, quartz cells, fuse, instrument cover, software CD, RS 232 cable and operation manual. Some of the other standard range of the system includes photometric range of -0.3 - 3.5 A, 0 to 220 %T, wavelength accuracy of +0.3 nm, wavelength reproducibility of < 0.10 nm as well as photometric accuracy of + 0.3% T (0-100% T) & +0.002 A (0-0.1 A) among others. 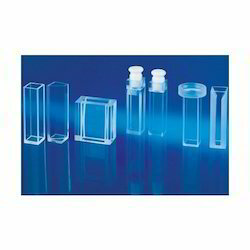 We are supplying standard cuvette with lid, standard cuvette with stopper, Micro Cuvettes with black wall, Micro Cuvette with black walls and stopper, Light-resistant mobile cuvette, Cylinder type cuvette with stopper, standard fluorescence cuvettes with stopper, Micro cuvette with white walls and lid, micro cuvette with white walls and stopper, Micro-fluorescence cuvettes with lid, micro-fluorescence cuvette, biochemistry mobile cuvette, special requirement cuvettes and so on. Cell guaranteed transmission values on empty cells and deviations in a matched set. Looking for UV Vis Spectrophotometer ?